As debates progress on the weight of former Vice-President Atiku Abubakar in the Peoples Democratic Party, and his chances in the 2019 elections, the former VP has ruled out going to beg for the support of former President Olusegun Obasanjo, saying making peace with the ex-President is more of an exercise in futility. The Director-General, Atiku Support Group, Mr. Mark Wosi, who disclosed the ex-VP’s position, while speaking to our correspondent in Yola, Adamawa State, said Atiku had finally decided not to beg for Obasanjo’s support any longer, since it was clear that the former president would not budge. Wosi said, “Atiku believes the support of Obasanjo and, indeed, all Nigerians, are to be desired by anybody aspiring to govern the country. That is why he feels there is no need going to beg him over an offence that Obasanjo has never disclosed. “My principal is no longer interested in sending emissaries to former President Olusegun Obasanjo or begging him, to become the President of Nigeria. It is only God and Nigerians that will determine Atiku’s fate, not an individual,” Wosi added. 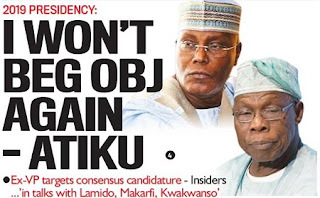 Though the ex VP’s aide said nobody was sure of why Obasanjo had sworn by Jove that Atiku would never be president, some political sources, however, traced the disagreement between the two politicians to 2003, when Obasanjo was warming up to go for a second term. A source, who is very close to former President Obasanjo but pleaded to be anonymous, recounted the story to our correspondent, saying, “To the president’s shock, he (Atiku), at that time, started making moves, within the Peoples Democratic Party, to contest against Obasanjo at the presidential primary election. This clear act of disloyalty caused ‘malaria’ for then President Obasanjo, to the extent that the First Lady, Stella (now late), had to be sent to Atiku to plead with him to have a re-think. The source also noted that the fact that a VP could dare his boss in that fashion was capable of establishing a lifetime enmity. “This is because a VP that seeks to unseat you through democratic means, and take your position, can equally poison you to death,” he summed. But Wosi, Atiku’s aide, shared a different view. He said the rumour that Atiku plotted to contest against Obasanjo in the 2003 PDP primary was long resolved, even before the primary election, as the then VP denied the allegation in its entirety. “But it is clear from Obasanjo’s body language that he does not want Atiku as President because the latter foiled his third term ambition way back in 2006, because Atiku believed that such a constitution amendment would lead to dictatorship and a self-perpetuated presidency,” he averred. But another aide of ex-VP Atiku has a different perception on the real cause of the seeming irresolvable tiff between Obasanjo and his principal. “Obasanjo’s problem with Atiku is not personal, it’s only based on principles. It has to do with certain values. The only thing for Atiku to do is to meet those values, and here, we are talking about having the right approach to Nigeria and its people,” Ardo said, not wanting to make clarifications. While political pundits have continued to wonder why Obasanjo finds it difficult to forgive the many “sins” of his former deputy, some observers of Nigeria’s political sphere still share Wosi’s claim that Atiku’s ‘crime’ against his former boss was the role he played during the constitutional amendment exercise carried out under the Obasanjo regime, where he stood against the alleged third term agenda of his boss. When asked why he and Obasanjo were at loggerheads towards the end of their tenure, Atiku himself had told newsmen, “My offence was that I disagreed with him on the amendment of the constitution to remove tenure/term limits or what was popularly called ‘the third term agenda’. In fact, he sent the then Attorney-General and Prof. Jerry Gana to my office to bring the draft amendments to the constitution. After going through (them), I found out that tenure limits had been removed. In other words, he could be President for life. But having realised his ‘error’, Atiku had, in the past, made several attempts at ensuring that Obasanjo forgave ‘his many sins’. In November, 2014, during the build-up to the 2015 general elections, Atiku, in company with the National Leader of the All Progressives Congress, Asiwaju Bola Tinubu, had met with Obasanjo in his Abeokuta home, where they apparently pleaded with him on the possibility of an Atiku presidency on the platform of the party. Then, the Tinubu-led emissary to Obasanjo was thickened with the involvement of a former Minister of Education, Prof. Babalola Borisade (now late) and Elder Oyewole Fasawe, who were known to be very close to the former president, as well as Maxwell Gidado, Atiku’s Campaign Legal Officer. Shortly after Atiku defected from the ruling APC to the PDP, former President Goodluck Jonathan had also advised the Wakili Adamawa (as Atiku is fondly called) to seek reconciliation with Obasanjo should his dream of becoming Nigeria’s president be realisable. “We’ve all learnt at different times that you ignore OBJ to your own peril. OBJ has the magic wand, respected at home and abroad,” Jonathan said. They are also of the opinion that finding the appropriate emissaries to beg Obasanjo and obtain his forgiveness is the second leg in Abubakar Atiku’s political destiny, since his re-defection to the PDP, was also part of Jonathan’s recommendation. In apparent reaction to ex-president Jonathan’s advice, however, Atiku’s media spokesman, Mazi Paul Ibe, had promised that the former VP would not hesitate to work out meeting Obasanjo and begging for his pardon. The latest effort at reconciling Obasanjo and Atiku came barely three months ago; precisely in October, this year, when a former Chairman, PDP Caretaker Committee, Ahmed Makarfi, visited Obasanjo at his Olusegun Obasanjo Presidential Library in Abeokuta, Ogun State. Though journalists were prevented from having access to the venue of the meeting, sources close to the meeting told our correspondent that Markarfi spoke to the former president on how he could assist in rebuilding the party with the possibility of Atiku’s return. Obasanjo was, however, said to have turned down the request on the ground that he was long done with PDP. Also, The Point reliably gathered that members of the Action Democratic Party, a political party believed to have been sponsored by Atiku, led by Chief Alani Bankole, father of the former Speaker of the House of Representatives, Dimeji Bankole, visited Obasanjo in his Abeokuta home with the possibility of getting his assistance and advice. The former president allegedly told the visiting team in plain language that he would only support their political party provided they would not give Atiku the presidential ticket of their party. But speaking in an interview with our correspondent in Abeokuta, the Ogun State capital, Chairperson of the Atiku Abubakar Youths Movement, Hajia Halima Oba, said her principal would not hesitate to meet with Obasanjo again and still plead for forgiveness. But the Acting Chairman of the Labour Party in Ogun State, Comrade Abayomi Arabambi, maintained a different stance. forgiveness of Obasanjo to win an election in Nigeria. While maintaining that former President Obasanjo was not the only one that would vote Atiku into power, Arabambi lamented that Nigerians were seriously groaning under economic hardship foisted on them by the Muhammadu Buhari-led APC government, which Obasanjo seriously campaigned for during the build-up to the 2015 presidential election. Already, the ex-VP, encouraged by the warm reception accorded him at the recent Convention of the PDP, is reportedly talking to other presidential aspirants in the party, with a view to getting them stand down, so he can emerge a consensus candidate. Sources at the ASG, his campaign headquarters, revealed that he had instituted committees, under him, to negotiate with other presidential hopefuls in the PDP, who include Malam Sule Lamido, and Makarfi, the immediate past chairman of the party. Similarly, Atiku is said to have reached out to the camp of a former Governor of Kano State, Senator Rabiu Kwakwanso, an aggrieved APC chieftain believed to have finalised his move to defect to the PDP come next January. promised to give him the needed consideration. Soon, you will hear the good news that Atiku is the PDP consensus candidate,” the source, preferring anonymity, declared.